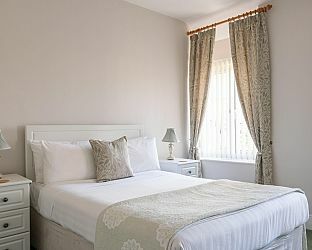 A warm welcome is assured at The Old Bungalow Guest House in Cirencester, a delightful award-winning guest house just a few minutes' walk from the town centre with its choice of fine inns, shops, restaurants and the acclaimed Corinium Roman Museum. Cirencester is the perfect southern gateway into the Cotswolds. Visit Cirencester Gloucestershire and the surrounding villages and stay in bandb, hotel or self catering cottage accommodation provided by BedPosts members. Under the streets of the old market town of Cirencester are the remnants of the Roman town of Corinium dating from AD 75. Beside Londinium (London) it was the largest and one of the most important Roman towns in England, built to the classic grid plan of straight streets. Saxons destroyed it in the 6th century. It rose again in the Middle Ages with the modern name Cirencester with no resemblance to the old grid system. It's located at the crossing of two great Roman roads - Foss Way and Ermin Street. Cirencester’s large 15th-century church of St John the Baptist, in the Market Place, is built of pale yellow stone. Having been in large part paid for by wealthy wool merchants it is known as one of the many Cotswold 'wool churches'. The pulpit of the church is shaped like a great wineglass. On the wall beside it there is a 17th-century hourglass which was used by the preacher to time his sermons. Note the coloured statue of a blue-coated boy, used in the 18th century to raise funds for the church’s primary school. Visit the park - you can walk along its 5 mile tree-lined Broad Avenue or ride horseback along part of it. The 3000 acres of wooded parkland were laid out in the 18th century by the 1st Earl Bathurst. The poet Alexander Pope, who assisted, has a summerhouse named after him. The Corinium Museum in Park Street houses one of Britain's most valuable collections of Roman antiquities. The exhibits are all from Cirencester and the Cotswolds including sculpture, jewellery, pottery, cooking vessels and mosaic ?oors. If you seek accommodation near Cirencester in Gloucestershire you have come to the website of a “club” of providers who offer affordable quality accommodation around UK in hotels, bed and breakfasts, guesthouses, inns, and restaurants plus self-catering cottages and apartments .